If you’re a student or a fresh grad, it’s only natural you don’t have much to show off on your resume. Having little to no experience yet doesn’t mean you cannot get the job you want. You just need to know a couple of hacks how to present yourself. 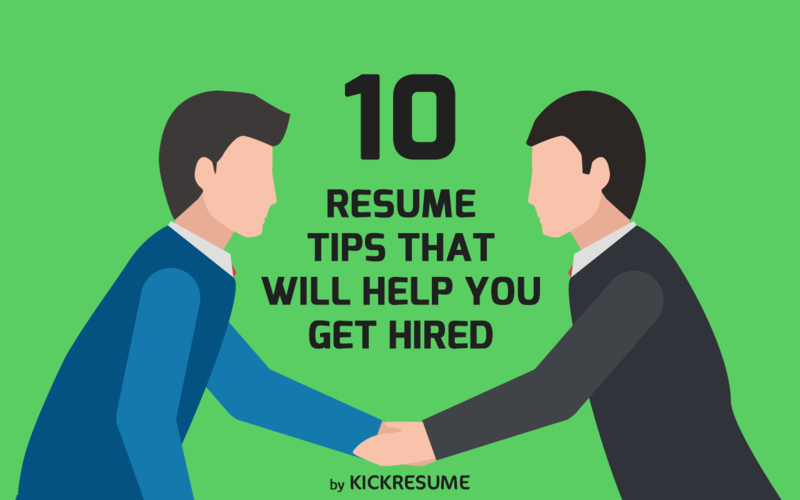 If you’ve already “found yourself” and know for sure what you want to do, you’re half way through because a clear career goal is the most important aspect of an entry-level resume. When you know what job you’re going for, you can clearly emphasize your skills and personal traits that relate to that job. It is also easier if you’re applying for a job in the area you studied in college. Applying for a job that’s far different than your college major might be a bit problematic without experience. Since you have no evidence you’re skilled in the industry, you must find other ways to convince the employer of your abilities. When you have no experience, you basically cannot provide evidence you have certain skills. That’s why you should use the transferrable skills you gained in college or elsewhere and apply them to the job you’re going for. You may have great organizational, communication, or leadership skills – why not giving a concrete example of a time you demonstrated them? You can also mention how you think these would translate to the job you want. When you identified your transferrable skills, your summary is the right place for showcasing them. Let the hiring manager know your skills and strong points make you a great candidate for the job. Use action verbs such as determined, focused, developed, achieved, etc. Express a deep interest in the job and emphasize your willingness to learn new things. Let your personality shine through the “paper”. A personality of a candidate is a very important aspect the hiring managers take into account. From how you appear personally, they can tell what you’d be like as an employee, how apt you’d be for the job, how quick a learner you are, how diligent you are. Also, much can be guessed from your academic results. Since your resume doesn’t contain that much information, show the hiring manager more of yourself. Add links to your social media, LinkedIn profile, personal website, blog, or photography portfolio site. You can also hyperlink your email address so that contacting you is only one click away. You might be surprised but even what you did in your spare time during college and your hobbies tell a great deal about you to the hiring manager. It goes without saying, only list activities that in a way enriched you and made you skilled at something worth mentioning. Also, you might have acquired most of of the skills you have by self-learning. This is also very favored with the recruiters: If you learned how to code by yourself, if you’ve taken online courses and are now skilled in something that might help you in the job, or if you’re jjust good at something you never studied in college, definitely mention it. What you’re missing out on experience, try to make an impression with the design of your resume. Don’t be afraid to be creative. Obviously, suit your resume to the industry you’re in. There are jobs that allow you to be more bold and creative and some that require more traditional resume. 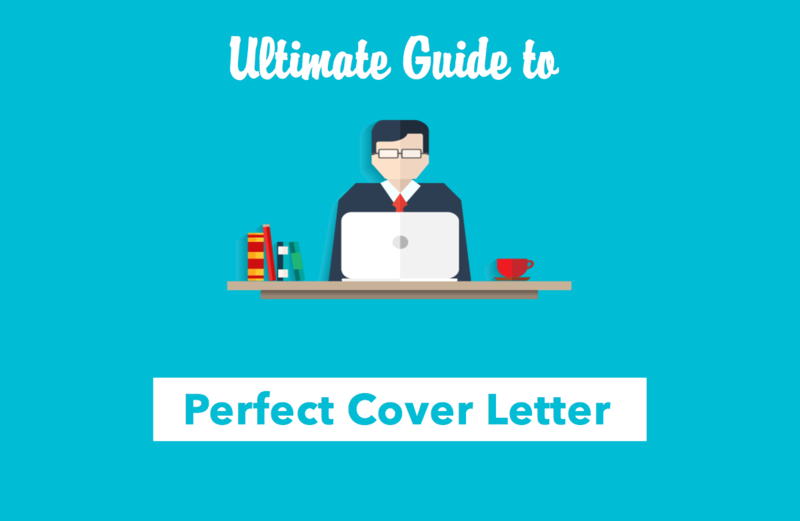 One way or another, if you send a generic, boring resume that looks like everyone else’s, you’ll be just another ordinary fresh grad that doesn’t know how to impress. If you’ve ever done an internship or volunteering, good for you! There’s nothing hiring managers like to see more than a determined and enthusiastic person. Volunteering can teach you loads of valuable skills. What if I’ve never had internship, nor done any volunteering? Keep calm. You may have Be specific, Mention a time you professed leadership, team-spirit etc. If during your college years you focused only on your academic achievements, mention that. You have many possibilities on how to convince your future employer that you’re competent enough to get the job or at least that there’s potential in you they can use. Your academic or other achievements. Mention certificates. Be specific and tell them HOW you think your academic knowledge would benefit to the job. you can have skills that you learned by yourself. TIP: It’s better not to include any experience than including an experience that’s irrelevant . Yeah, in college we all needed money so we did service jobs to pay for parties and other amusements. But your part-time job at Starbucks really isn’t relevant when you’re now applying for a job in accounting. Jane Vader has selected a simple, yet eye-catching resume template with clean layout and easily readable sans-serif font. She has included a link to her blog for the hiring manager to check her writing samples. In the summary at the top of her resume, she has determined a clear career goal and used action verbs to emphasize her commitment and interest in the job. She has listed her education info in a clear structured way. 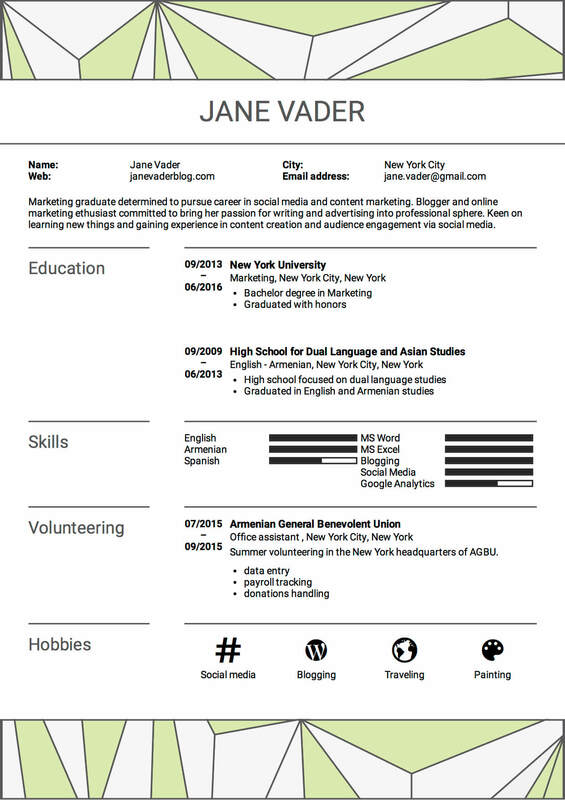 Normally, an entry-level resume should contain a more detailed education summary. Jane has listed only her strongest and the most relevant skills to the job she’s applying for. She has volunteered for an NGO during the summer – good for her! Volunteering, no matter how irrelevant to the job, always looks good on a resume. Her hobbies reflect her career goals and reveal a bit about her personal traits – from the four hobbies stated you can tell she’s creative, energetic and open-minded person. She hasn’t put “References available upon request” at the end. We hope you found our tips useful. Good luck in finding your dream job!